Just finished these. 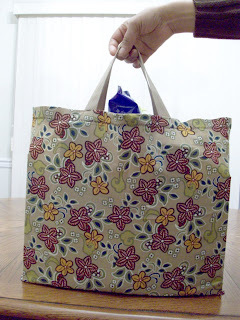 I am really liking my Eco Chic Grocery Totes and hope more folks get into using "earth friendly" bags. I was recently at Sam's club and saw that they sold a larger bag, but i wasn't really impressed with the quality of the material used. It almost felt like it was a coated paperbag. Two of them cost $2.99. I thought that was kind of a rip off considering they look like after 2 or 3 uses, they would be in the trash along with the ugly plastic grocery bags that you get from the grocery store. I was a busy bee last week. We had a mandatory shutdown on President's Day, I got my wisdom teeth pulled on Wednesday and took Thursday off to "recover". I had plenty of time to get alot of things done. 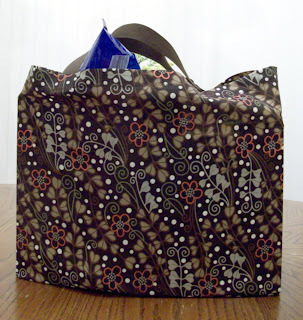 Monday I spent most of the day cutting and making 4 new bags for the Spring. 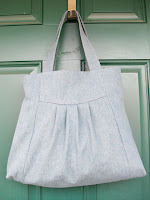 I have 2 new Jenni bags up and posted and I also made 2 more Book Totes. I just love those 2 styles and every time I look at the photo's, I just want to keep them for myself. I started making product pages for my website and I am satisfied with that. Building a website with NO prior knowledge of HTML and such is hard... it's VERY hard. But it is worth it. I love knowing that I created it. There are alot of other things that I would like to do with it and plan on taking a Dreamweaver course in the Spring, hopefully if we get schedules figured out. Last week, was a very productive week and I hope to have more like that. The Card holders are a wonderful and stylish way for you to hand out your business cards. They are roomy enough to fit approximately 40 standard size business cards. If you’re not a business card collector, you can also store your debit and credit cards, or spice up that gift card you are going to give for a special occasion. Card holders can be customized to match your custom bag. 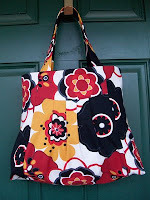 Please see my custom order page for more information. "Q. But isn't that stimulating the economy of China? If you spend it on gasoline it will go to the Middle East. Now I always like a funny email, but this email actually got me to thinking (more than usual). What this email is saying is very true. Yes we are going into stores in America and supporting the stores, but are we really uplifting America? Two weeks ago, I told myself that I am going to purchase only fabric made in America. 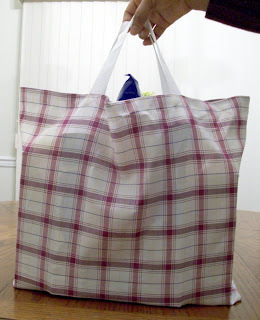 I went out to Joann Fabrics started shopping and found that it was harder than you think to purchase fabric that was “Made in America”. 9 out of 10 fabrics I picked up were from China. It was very discouraging to see that and it is now making me want to find some American fabric. 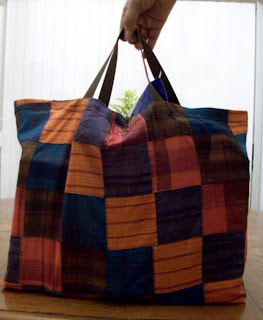 I recently read a blog from the company I purchase shopping bags and wraps from and found that they were having the same issues I was in finding some good American made products to sell. I am glad I am not the only one having this issue, but from what I read, these American products are far and few between. We as a nation have to start reaching out and buying American. So this is my stimulus plan. I am going to buy American whenever I can. Wake up folks. We DO have options; you just have to look a little to find them.